Antioxidants are the body’s source of protection from free radical damage. The importance of antioxidants in our diets is becoming more heavily researched. With the recent surge in marketing enthusiasm over organic products, ‘superfoods,’ and antioxidant-rich foods, consumers are becoming more educated on the quality and nutrient content of the foods they consume. Antioxidants are the body’s source of protection from free radical damage. The importance of antioxidants in our diets is becoming more heavily researched. 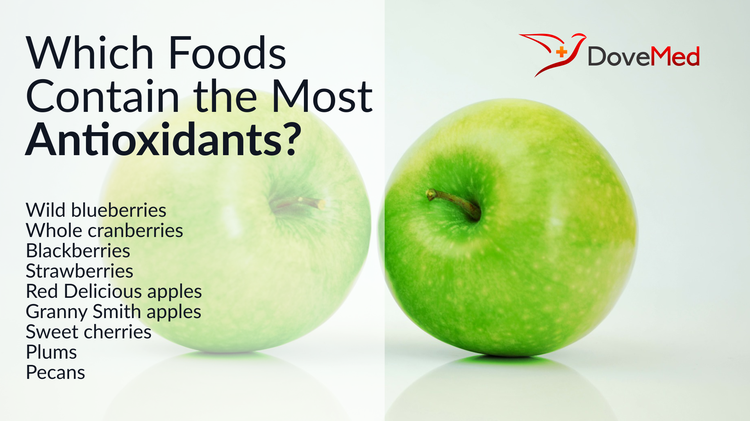 There are dozens of foods that have antioxidant properties; however, not all are created equal. There are a few vitamins, minerals, enzymes, and phytochemicals (plant chemicals) that are classified as antioxidants. Phytochemicals include carotenoids, flavonoids, and polyphenols. Some of the most acclaimed antioxidants include vitamins A, C, and E, beta-carotene, selenium, and the carotenoid lycopene. Carotenoids are typically red, orange, or deep yellow plant pigments that provide color to food and vegetables. Other examples of antioxidants include zinc, manganese, and copper. There are several fruits and vegetables that contain a significant amount of antioxidants. High antioxidant fruits include prunes, raisins, blueberries, blackberries, strawberries, raspberries, plums, oranges, red grapes, cherries, kiwi fruit, and pink grapefruit. Antioxidant-rich vegetables include kale, spinach, Brussels sprouts, alfalfa sprouts, broccoli flowers, beets, red bell pepper, onions, corn, and eggplant. Some antioxidant rich foods that have recently gained interest include tart cherries, wolf berries, Goji berries, and Acai berries. Whole grains are rich in antioxidants due to their selenium and vitamin E content. Tea, which is a source of the phytochemical known as flavonoids, is often ranked as high, if not higher, than many fruits and vegetables. Research conducted in 2010 at the University of Oslo in Norway highlighted the difficult nature of classifying antioxidants, as the antioxidant content of a food consumed and the successive antioxidant activity in the target cell is variable. A direct relationship is not inevitable, and this factor makes it scientifically difficult to determine which foods with antioxidants are the healthiest. A French study completed in 2005 suggested that several factors might play a role in the bioavailability of phytochemical antioxidants such as absorption and metabolism of food. More extensive research on these factors in the future will allow for a more accurate hierarchy and classification of antioxidant foods. Make sure to consume high antioxidant foods with each meal. Several foods are fortified with antioxidants like vitamins C and E, beta-carotene, and selenium. Fresh fruits and vegetables, however, are the best sources of antioxidants, as they contain other phytochemicals that are healthier than cooked or processed foods. When buying these products at the grocery store, be aware that produce that is bought fresh frozen may be healthier than the produce that is left to over mature on the shelves. When planning your next meal, take the time to survey the foods you have chosen and determine if you have at least one antioxidant food amidst your ingredients. Chances are that it is simple to incorporate a fruit, vegetable, or a type of bean into the meal you have already planned. Building up your body’s ability to fight free radicals is an essential part of the equation to better health. Carlsen MH, Halvorsen BL, Holte K, Bohn SK, Dragland S, Sampson L, Willey C, Senoo H, Umezono Y, Sanada C, Barikmo I, Berhe N, Willett WC, Phillips KM, Jacobs DR, Blomhoff R. The total antioxidant content of more than 3100 foods, beverages, spices, herbs, and supplements used worldwide. Nutrition Journal. 2010;9(3). Manach C, Williamson G, Morand C, Scalbert A, Remesy C. Bioavailability and bioefficacy of polyphenols in humans. I. Review of 97 bioavailability studies. Am J Clin Nutr. 2005;81(1 Suppl):230S-242S. Halvorsen, B. L., Carlsen, M. H., Phillips, K. M., Bøhn, S. K., Holte, K., Jacobs, D. R., & Blomhoff, R. (2006). Content of redox-active compounds (ie, antioxidants) in foods consumed in the United States. The American journal of clinical nutrition, 84(1), 95-135. Pellegrini, N., Serafini, M., Colombi, B., Del Rio, D., Salvatore, S., Bianchi, M., & Brighenti, F. (2003). Total antioxidant capacity of plant foods, beverages and oils consumed in Italy assessed by three different in vitro assays. The Journal of nutrition, 133(9), 2812-2819. Carlsen, M. H., Halvorsen, B. L., Holte, K., Bøhn, S. K., Dragland, S., Sampson, L., ... & Barikmo, I. (2010). The total antioxidant content of more than 3100 foods, beverages, spices, herbs and supplements used worldwide. Nutrition journal, 9(1), 1. Vinson, J. A., Su, X., Zubik, L., & Bose, P. (2001). Phenol antioxidant quantity and quality in foods: fruits. Journal of Agricultural and Food Chemistry, 49(11), 5315-5321. Gil, M. I., Tomás-Barberán, F. A., Hess-Pierce, B., & Kader, A. A. (2002). Antioxidant capacities, phenolic compounds, carotenoids, and vitamin C contents of nectarine, peach, and plum cultivars from California. Journal of Agricultural and Food Chemistry, 50(17), 4976-4982.